GM just facelifted the 2014 Chevy Malibu, but they're sending Australia the old 'Bu. Looks like the Aussies are getting the US' sloppy seconds. 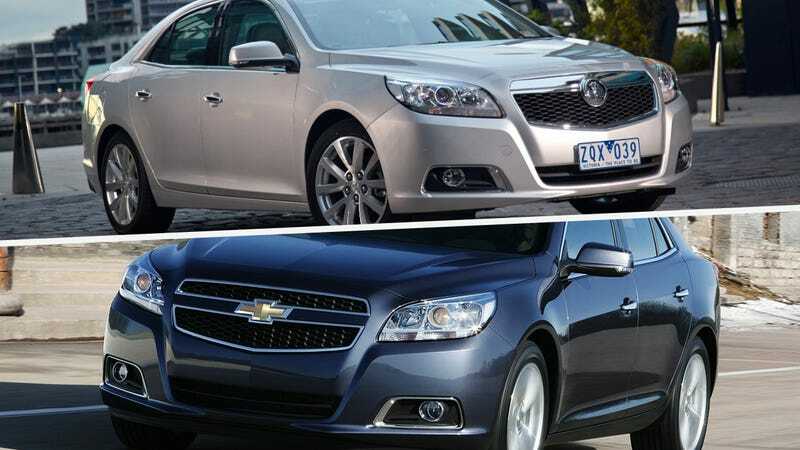 Yes, the Holden Malibu looks like a pre-facelifted Malibu with a new grill, and if you think I'm crazy, there's a picture of the US-model 2013 Malibu is in black under the silver 2014 Holden 'Bu. Autoblog reports that GM says they modified the Holden for the right-hand-drive Australian market. The drivetrain is retuned, the suspension is retuned, and the car even has new right-hand-drive spec tires. In the business, this is what I call "desperately looking for something to overshadow the fact that your new car looks just like your old one." At first I thought GM was just ashamed of the look of the new 'Bu and wanted to keep it out of foreign countries, but I think that now they're just cheaping out on the shrinking Aussie car market.